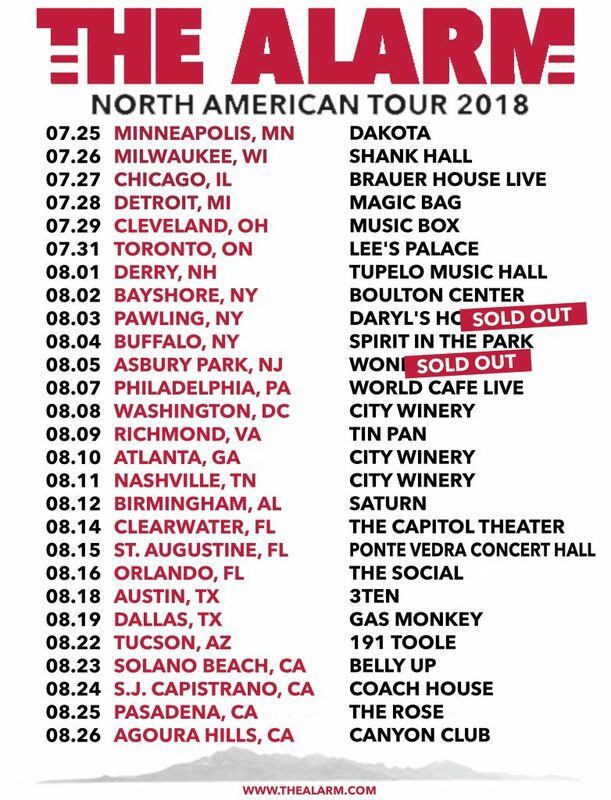 Tickets for The Alarm’s extensive North American 2018 summer tour in support of the brand new album EQUALS are on sale now. See dates and ticket information below. Dates in New York and New Jersey have already sold out for the concert tour that begins up in the Twin Cities of Minnesota with a performance at Dakota in Minneapolis and extends through the Mid-West with dates in Milwaukee and Chicago followed by a return to Motor City Detroit for a show at The Magic Bag. From there, the group head to Canada for a much anticipated concert at Lee’s Palace in Toronto, before heading down the eastern seaboard for dates in New Hampshire and Buffalo with a cluster of shows in and around the New York Metropolitan area. Descending south towards Philadelphia and Washington, there will also be performances in the Southern States of Virginia, Georgia and Tennessee which will also see The Alarm’s tour bus driving down into Florida for three highly anticipated dates. The mile-o-meter will then take a hammering as the final stretch of the tour heads West towards Austin and Dallas, Texas with a stop in Tucson, Arixona and on to the Pacific Coast for a grand stand finale in the State of California. Order your copy of Equals now.